Mississauga, ON: Today marked the official opening of the long-awaited Hazel McCallion Campus (HMC) expansion, a 5-storey, 225,000 square foot building known as the HMC B-Wing that will increase enrolment capacity in Mississauga to over 5,600 students. The event drew over 200 guests, including provincial and municipal elected officials, donors and industry partners. Dr. Mary Preece opened the formal proceedings and acknowledged the $67.7 million in infrastructure funding provided by the provincial government to support the construction of B-Wing. She also thanked the City of Mississauga for its donation of the land on which HMC is situated, as well as the many private donors who contributed to Sheridan’s Get Creative Fundraising Campaign, which raised $9 million to support the expansion. Those in attendance included The Hon. Deb Matthews, Minister of Advanced Education and Skills Development; The Hon. Charles Sousa, Minister of Finance and MPP – Mississauga South; The Hon Dipika Damerla, Minister of Senior Affairs and MPP – Mississauga East – Cooksville; and Amrit Mangat, MPP – Mississauga – Brampton South. Attendees had the opportunity to explore a variety of interactive exhibits, all reflective of one of the event’s twin themes: creativity and sustainability. They included a public exhibit in the Creative Campus Gallery entitled “human: purposeful creativity for our communities”; a sustainability living lab; and a display from the Material Connexion Library, a first-in-Canada collection of innovative materials for interior design and architecture that is housed in the new facility. HMC B-Wing was designed by Moriyama & Teshima and Montgomery Sisam – Architects in joint venture, and embodies Sheridan’s Creative Campus philosophy and commitment to sustainability. Its features include a creativity commons where students can mingle and collaborate; a public Gallery showcasing the creativity of the Sheridan community; and the Institute for Creativity. Programs offered in the building include a grouping related to sustainable built environment, including Architectural Technology, Interior Design, and Interior Decorating. Programs in Advertising , Marketing and Visual Merchandising complement the business diploma and degree programs that have been offered at HMC since its opening in 2011. The building is built to LEED Silver specifications with potential for Gold. Sustainability features include smart building infrastructure, zero waste foundations, water efficiency and reuse, lighting and ventilation as well as the use of sustainable materials. 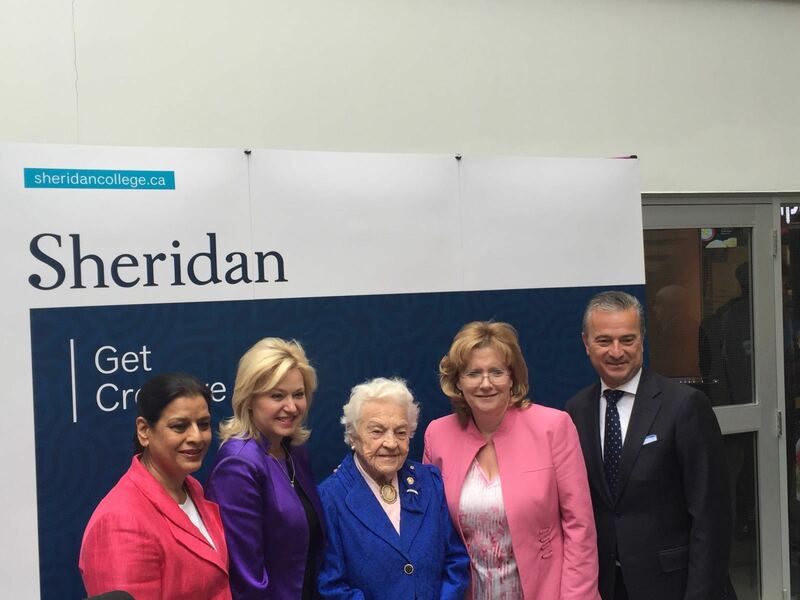 Sheridan College Davis Campus – it gives me immense pleasure to join the faculty, staff, students and leadership from Sheridan College for the installation of Hazel McCallion as this institution’s first chancellor, Mayor Bonnie Crombie said today. 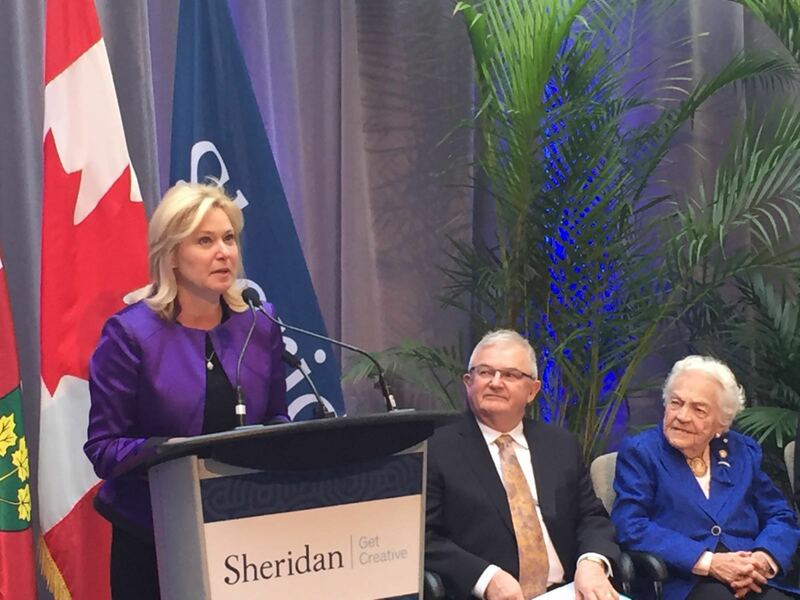 As you know, when Sheridan succeeds, so does Mississauga, Mayor Crombie said citing how phase two of the Hazel McCallion Campus is well underway, on nearly nine acres of prime land made possible through a partnership between Mississauga and Sheridan. “I have always maintained that all levels of government have a responsibility to ensure people have access to quality education,” Mayor Crombie said. “This is especially the case at the local level. We want our educational institutions to be strong because our young people must reach higher,” Mayor Crombie added. The Mississauga expansion project will result in a new facility on the same site; housing state-of-the-art classrooms; studios; labs and production spaces; a Centre for Creative Thinking and a gallery space to showcase students’ creativity and innovation. The new facility will offer program clusters in architecture and interior design; creativity and communications; business; advertising and merchandising. The new space will accommodate an additional 3,200 full-time students for a total enrollment of approximately 5,500 active minds. “By partnering with Sheridan, we are building a complete city – a place where all people can earn an education, find a good-paying job, start a business, pursue their dreams and enjoy an unrivalled quality of life. Mayor Crombie speaking during the installation of Hazel McCallion as Sheridan College’s first chancellor. Brian Dawson, President of Sheridan’s Board of Directors, also pictured. Mayor Crombie joined by Hazel McCallion, Sheridan President Jeff Zabudsky, Mayor Linda Jeffrey, and Mississauga-Brampton South MPP Amrit Mangat.